Peter Tasgal: The author is a consultant focused on the agriculture space with previous experience as CFO and board member of a $100 million CPG business headquartered in Montreal, Canada prior to which he was an investment banker for over 10 years. His contact information is as follows: Peter Tasgal, ptasgal1@gmail.com, 617-794-4058. There are positives and negatives of growing produce far from the end consumer, but most would agree that all else being equal, local is better. Chilean grapes stored in refrigerated containers for 1 to 5 months at a temperature of 30 to 32 degrees Fahrenheit and which have traveled 5000 miles are not going to taste as good as freshly picked grapes from your local farmers market. Community desire for local produce, combined with improvements in hydroponic, lighting and other technologies, have attracted participants looking to grow in controlled environments. Controlled environments include greenhouses – both ground level and rooftop, buildings, and 40 to 53-foot shipping containers re-purposed for growing. The fundamental reliance on rain and sun makes traditional farming the most efficient and environmentally friendly form of agriculture. However, generally it is furthest from the end consumer. Shipping containers on the other hand can be located at or are very close to the consumer but are the least efficient in terms of cost per delivered pound. Greenhouses and contained structures are in the middle of the two. Depending on their locations, greenhouses and other contained structures can be close to the consumer. Also, they can deliver produce at a competitive price for certain items. Technological innovation is happening in all areas of agriculture. The biggest evolutions are happening in environmental control systems, data collection, material handling/logistics , traceability/food safety and crop management. 2 companies founded out of Boston based Flagship Pioneering, Indigo Ag, Inc. and Inari have raised $600 million and $40 million respectively. Indigo Ag is using natural microbiology and digital technologies to improve grower profitability, environmental sustainability and consumer health. Inari is building the world’s first seed foundry to reintroduce genetic diversity to achieve desired field experiences. New Zealand based BioLumic is introducing Ultraviolet light to transplant crops at nursery stage to increase crop yield. Philips recently introduced its GreenPower LED production module, optimized for closed, climate- controlled cultivation facilities. The module allows for a dedicated combination of spectrum, intensity, timing, uniformity and positioning of light to optimize production. Let’s make the assumption that assumption that the consumer prefers locally grown produce, and that locally grown produce tastes best. The question I am then posing is: Can produce grown in a shipping container be priced competitively with traditional farm grown produce? Or, alternatively, does the consumers’ mindset need to be changed for them to be willing to pay a large premium for local products to enable container farming to work? Essentially, does the industry need a “Starbucks model” to motivate people to pay a premium price for a premium product when lower cost, albeit less quality product is available? The University of California Cooperative Extension Agricultural and Natural Resources – Agricultural Issues Center did a complete analysis in 2015 of a range of crops. One of these crops was romaine hearts from the Central Coast Region (Monterey, Santa Cruz & San Benito Counties). They determined that based on a range of assumptions it costs an average of $0.65 to deliver a pound of romaine hearts to a blend of regions across the United States (See Appendix A for Cost Analysis – Conventional Farming). Traditional retailers in the United States look for 40 to 45% gross margins in their produce departments. This allows retailers to sell a pound of romaine hearts for just over a dollar to meet their return targets. Grown in a container farm, the cost to deliver a similar product as described above is at best 3.6x the cost of conventional farming ($2.38 per pound), and more realistically 10.9x ($7.14 per pound - See Appendix B for Cost Analysis – Container Farming). This is impressive for container farming, especially given the square footage of a container is equal to approximately 1% of the square footage of an acre of land. To determine the viability of selling container grown produce at the retail store level, I did a store check on a range of greens at a local supermarket. Greens were chosen as they are the easiest to grow in a container because they stay at a vegetative stage and do not go to a flowering stage. The flowering stage requires additional lighting of different color for optimum growth. As shown above, container farming can provide a competitively priced source for many of the locally grown items, as well as small packages of specialized herbs. The items for which container farming can be competitive are largely niche products. Examples of this are products sold in low volumes at a Whole Foods Market in an affluent Boston suburb. For example, there were 30 small boxes of organic herbs on the shelf during my visit, equating to less than 2 total pounds of herbs. Where are likely efficiencies to be found in container farms? According to American Hydroponics (“AmHydro”) the maximum number of plants per year that can be grown in a container are 46,592. This is based on the assumption of 3,584 plant sites are turned 13x per year. This case assumes a 2oz plant, which equates to 5,824 pounds of annual production. This is the most aggressive yield case and assumes each of the following: (i) 4-week grow time; (ii) No loss; and (iii) no downtime. A much more realistic yet still aggressive yield case would be closer to 4,000 pounds of production. This is based on a 5 to 6 week grow period, 10 turns per year, and some downtime for container maintenance and cleaning. After discussions with container farmers, their estimation of actual yields are closer to 3,000 pounds per year. Efficiency improvements are likely to be limited in terms of yield, given the size constraints of a container. Freight Farms is listing its containers at $85,000 prior to delivery and set-up. AmHydro projects a delivered figure of $87,000. Each of these figures assume use of a container typically purchased from shipping lines and/or container lessors once determined the containers are no longer seaworthy, retrofit for hydroponic farming. CAI International, a major container lessor, published in its 2017 annual report a 3-year average residual price for a 40-foot standard dry van container of $1,101 and $4,045 for a 40-foot high cube refrigerated container. Therefore, the vast majority of the cost of a container ready for farming lies in its retrofitting and profit margin to the container farm seller / lessor. Determining the true cost of retrofit for a container is difficult. Dan Backhaus, the number 2 person at now defunct PodPonics, a company which had raised $14 million in funding, estimated the cost of retrofit at approximately $20,000. Additionally, a Google search of container farms for sale depicted several Freight Farm units originally purchased in 2016 and now being listed for sale between $55,000 and $68,000. Efficiencyimprovementsarelikelytobegreatestintheareaofcontainercosts. Ifthemarketgrowsthere will be additional container farm suppliers which will bring prices down. In Appendix B, under the likely scenario, the amortization of the cost of the container represents $2.25 per pound of production. Cost of labor in the region. Improvements in labor efficiencies are likely to be a function of what is trying to be achieved in the container farm. As the popularity of container farming increases, labor is likely to become more skilled and containers will be in closer proximity. Technological advancements have been very effective in reducing labor costs (eg. viewing plants and monitoring pH levels and other internal variables from a distance). However, most of these technological advancements are what has made container farming viable today. Most of these technological enhancements are not since but rather prior to the advent of the container farm. There has been limited research on the use of robotics to improve harvesting and seeding in container farms. This could potentially have a great impact on labor efficiency but will be very expensive. Based on my discussions, the item that farmers underestimate the most is the cost to provide heating and cooling to the container farm. The containers themselves are solid steel masses but then are being modified for an alternate function. Modifications are frequently made to provide multiple entrances and exits. Additionally, provisions for ventilation, heating and cooling are needed to achieve optimal temperatures and humidity levels for plant growth. Each of these modifications reduces the solidity of the container and can require further power. Additionally, as high levels of lighting are required for growth, these lights can generate significant levels of heat. If the container is expected to be mobile, there may be limitations to types of power which can be used. Copious work has been done on the use of solar, with limited benefits to date. The limiting factor largely is the square footage of the container (typically 8ft x 40ft). Increased lighting efficiency, predominantly within LED, has improved power efficiency. These improvements are likely to increase steadily. The greatest cost improvement will be the pricing of the retrofit container. 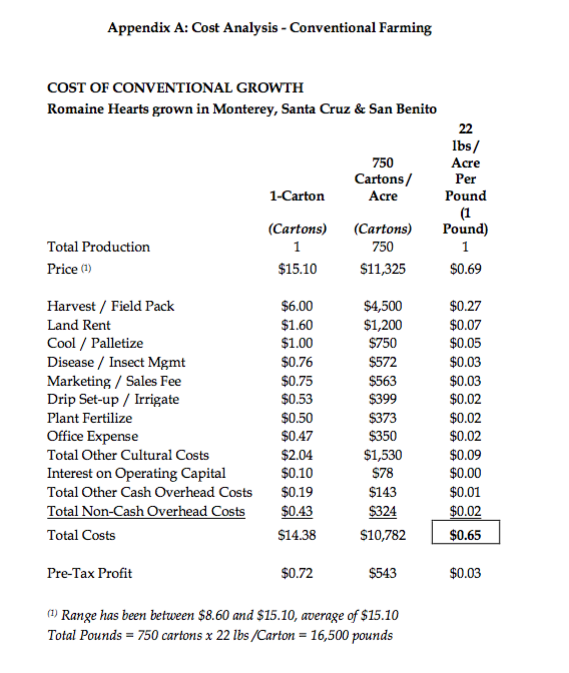 In a blog posting in March of 2018 by the Indoor-Ag Conference, it was estimated that branded containers cost in the range of $50,000 and $120,000 to purchase (our analysis uses $85,000 to $87,000) and those which were “homegrown” cost between $15,000 and $20,000. The cost of the branded containers should come closer to those which are homegrown. In the same blog, it was estimated that the cost of LED lighting, representing 25% of the fixed cost of a container, is expected to fall 40% from 2017 to 2020. Labor is a second area where efficiencies will likely occur. However, gaining short term efficiencies in labor will likely be capital intensive. Given there are an estimated 500 container farms in the world, the incentive to infuse large amounts of dollars into container farms by R&D focused entities, is likely limited. The efficiencies will likely initially come to greenhouses and other contained environments; then the technology will be transferred to container farms. The typical farmer is aging and 80% of container farmers are new to growing – Therefore, this brings new farmers into industry. Investors have shown interest in providing funding to the industry. Containers can be placed almost anywhere due to size and having been retrofit offsite. Comparatively low priced to set-up. However, the question still remains, why choose a container instead of other forms of controlled environment farming facilities. This is a complex question because the constraints of the container footprint can impact the efficiencies of the container. I outlined 2 major reasons that could spur the growth of the container farm industry, as outlined below. Reason 1: The primary reason that I can see for growth in container farms is that new farmers want to get into the industry with a limited investment. In no other form can one own a farm and all the necessary equipment for less than $100,000, and be up and running within a few months. This is an enticing motivator for an individual interested in going into farming. However, why the need for container farming. If a product can be grown in an alternative contained environment at a location within a day’s transport from the end consumer, at a cost that is far below that of produce grown in an on-site container farm; then there seems limited need for the container form for farming. Potentially container farming would be practical in an extremely cold location, where building a solid structure would be problematic. Following a full analysis herein, my conclusion is that container farming is and will continue to be a niche product. It appears that fewer new farmers will buy container farms as they learn the results others have experienced. I believe container farming will become an increasingly niche product focusing on area’s that cannot get recently harvested produce at a reasonable price as well as niche restaurants and other food establishments that are willing to invest their resources to tout the growth of produce on-site. The benefits of growing in a container, versus growing in an alternative contained environment are largely supply-side benefits: (i) Need for more farmers in the market; (ii) Investors seeking returns in the space; (iii) Entry into market with limited capital; (iv) Time to market; and (v) Limited footprint. It is on the demand side that the viability of the business comes into question. What do you get by growing right next to your location, versus, growing within a short distance of your location? The answer lies in the marketing of the container farm. It is my belief that the entities whom are willing to invest time and money to gain this marketing appeal will be very limited. 2 Please note that in January of 2019 it was announced that Cultivar was closing after being opened for less than 2 years. Speaking to Cultivar’s owner, Mary Dumont, she stated that the farm would be for sale in the near future.